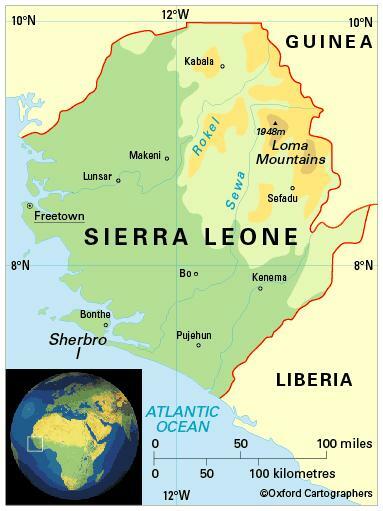 The Republic of Sierra Leone (Portuguese for ‘Lion Mountain’) in West Africa is bordered by Guinea to the north, Liberia to the south-east, and the Atlantic to the south and west. Tropical and humid all year, but cooler on the coast. The dry season is November to May, when the dusty harmattan wind blows from the Sahara; the rainy season lasts the rest of the year. The most significant environmental issues are depletion of natural resources during the civil war; deforestation and soil exhaustion due to over-harvesting of timber; expansion of cattle grazing and slash-and-burn agriculture; and overfishing. 5,979,000 (2012); 40 per cent of people live in urban areas. The population growth rate stood at 1.8 per cent p.a. between the years of 1990 and 2012. In 2012 the birth rate was 37 per 1,000 people (46 in 1970) and life expectancy was 45 years (36 in 1970 and 40 in 1990). Population figures are unreliable because during the civil war in the mid-1990s up to 50 per cent of the population had to leave their homes in a mass migration to towns and neighbouring countries. The vast majority of the people are of Bantu origin: Temne (35 per cent in the 2008 census) and Limba (eight per cent) people mostly in the Northern province; Mende people (31 per cent) live in the Southern province and Eastern province. Additionally, there are nine other Bantu ethnic groups, including Kono (five per cent), Mandingo (two per cent) and Loko (two per cent). Krios (two per cent) are descendants of formerly enslaved 19th-century immigrants who live mostly in and around Freetown. The small Lebanese community, mostly of traders, decreased during the 1990s. Sierra Leone is classified as a low-income economy by the World Bank.